I love a good chowder, and corn chowder is one of my favorites. 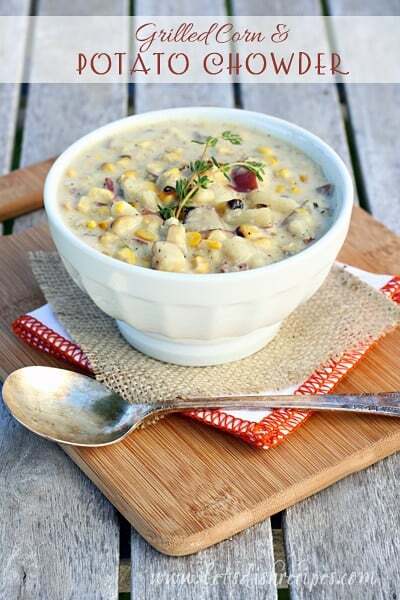 I’ve tried a lot of corn chowder recipes over the years, and this Grilled Corn and Potato Chowder recipe is the one I always come back to. I think it’s the grilled corn that makes the dish for me, although you can just throw in some canned or frozen corn in a pinch. But really, once you try it with the grilled corn, you’ll never go back! If using an outdoor grill won’t work for you, just grill your corn under the broiler for a few minutes until it starts to blacken. I love that this soup is nice and thick, just like a chowder should be, but it doesn’t use a roux. Instead, it’s thickened with pureed corn and slightly mashed potatoes–I just use a potato masher right in the pot, just before serving. 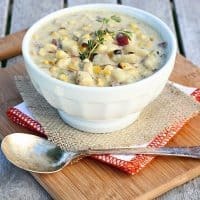 This corn chowder is fabulous on its own, but even better served with a variety of toppings, like bacon, cheese and chopped green onions. Preheat outdoor grill for medium-high heat. Brush corn with olive oil. Grill corn for 12-15 minutes, turning every few minutes, until slightly charred. Cool slightly and cut kernels from cobs. Puree 1 cup of corn kernels in a food processor or blender until smooth. Melt butter in a large stock pot over medium-high heat. Add onion and saute until soft, 5-7 minutes. Add broth, milk, potatoes, salt and pepper. Simmer until potatoes are just tender, 10-12 minutes. Stir in corn kernels, pureed corn and half and half. Bring to a simmer. Simmer for 15-20 minutes, stirring occasionally, until potatoes are done. Using a potato masher or immersion blender, slightly mash some of the potatoes, leaving some whole pieces. Stir in fresh thyme, and additional salt and pepper, to taste. This looks like such a perfect cold weather meatless dinner. Corn chowder is so good! Oh I have really been looking for some new comfort food recipes now that it’s cooler. This is perfect. This looks very delicious and it is very doable too. I bookmarked it and I am going to make this as soon as possible. I will let you know the outcome. Thanks for sharing. Just found this a few days ago and HAD to make it! We had it tonight and it was perfectly delicious. I am going to have the leftovers in a few days with bread bowls! Thanks for the great recipe. I love this. It reminds me of one of my all-time favorite soups from my mom’s repertoire – a corn and crab chowder.